Anti-smoking movement is remarkable lately in the world. It might be the same in your country, here in Japan more stores, restaurants and streets became smoking free. 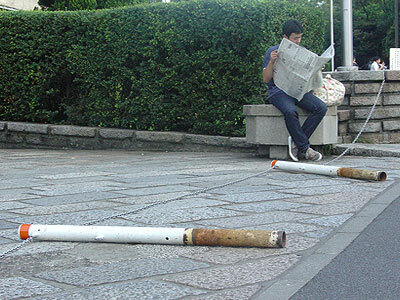 In spite of the movement, two huge tobaccos are on a street!! Who smoked such huge tobaccos!? There is a man reading newspaper without getting scared with them. Well, the trick is they are pulled polls in a parking lot.